These highlights chronicle the year 2017. Created incrementally as new photos were available, the year runs generally "backwards" on this page. The abbreviation "MTY" means "Monterey County" in the text below. Text by Don Roberson. Photos on this page are copyrighted by the photographers to whom they are attributed, and may not be reproduced in any form (including other web sites) without the express consent of the photographer. April 2017 concluded with a new Big Day record for Monterey County: 217 species. 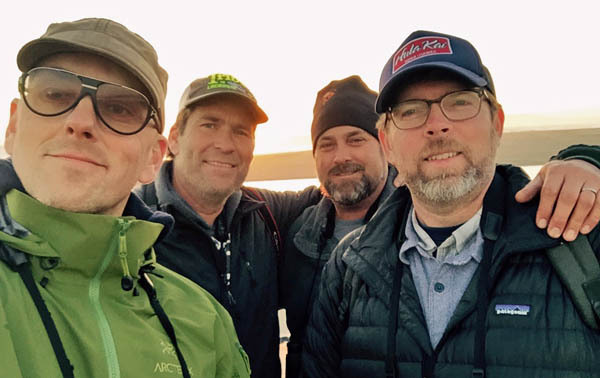 On 28 Apr 2017, the team of Blake Matheson, Paul Fenwick, Cooper Scollan, and Brian Sullivan (L to R, photo © B.T. Matheson) shattered the prior record of 208 species, set back on 1 May 1999. This was the first 'serious' Big Day in MTY in the 21st century under formal ABA rules [>95% of species must be identified by all; this team had 97%. They also used no playbacks]. Extensive scouting before the Day helped locate most breeding species as well as 5 species of lingering geese; strong winds at the coast helped sea-watching (lots of Black-footed Albatross); and a string of rarities around Moss Landing added the frosting: Redhead, White-faced Ibis, Red Knot, Franklin's Gull and even better — and fully consistent with the "Year of the Gull" — were two extraordinary gulls at the Pajaro R. mouth: a first-cycle Lesser Black-backed Gull (the 3rd for 2017!) 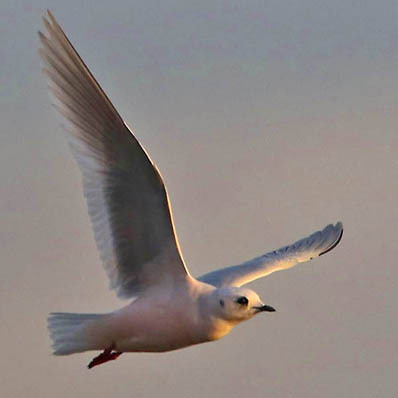 and a first-summer Little Gull flying over (below left © Paul Fenwick). 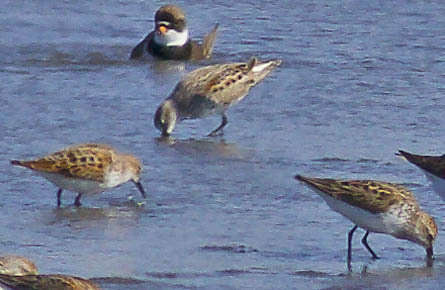 And then — even more remarkable — an adult Little Stint was at Jetty Road, Moss Landing (below right © B.L. Sullivan; left-hand wader with Western Sandpipers & Semipalmated Plover). This is the first spring record for Monterey (3rd MTY record overall) and a major rarity anywhere in North America. The i.d. of this rare wader did not get sorted out until a day later, and efforts to relocate it failed. You'll read below that three rare passerines at Laguna Grande lingered into March. As it turned out, one of them remained until the third week of April. This Yellow-breasted Chat (left, photo 19 Apr © D. Roberson) was initially discovered 20 Nov 2016 and lingered through at least 21 April, a full 5 months later. On its last date it was singing a 'whisper song' in its favorite patch of willows at Laguna Grande. The fact that it was singing, and had developed a black bill and black lores over the winter, means that it was a first-winter male. The speculation (below) that it might be a female because of pink bill and brown lores turned out to be wrong. The bird did replace its tail over the winter, and the loss of that tail might have been the reason it stopped migration and stayed here. Again, that's speculation. The first four months of 2017 may long hereafter be known as the "Year of the Gull." 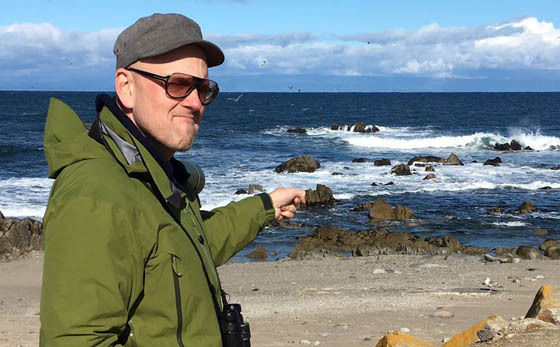 It started in January, with the California Central Coast "Trifecta" — a Slaty-backed and Black-tailed Gull here in MTY — and an adult Ross's Gull in San Mateo County. Alternatively, local MTY birders were also treated to a gull "Trifecta" — with a Lesser Black-backed substituting for Ross's. All are featured farther down this page. March brought further madness (see just below) but in early April a first-winter Laughing Gull at Pt. Pinos, found by Blake Matheson on 4 April, added yet another vagrant to the pile. It was in active wing, tail, and body molt (photos right, upper © BT Matheson, lower © D. Roberson). Laughing Gull is occurring with more frequency; this was at least the 17th MTY record, but just the 4th for the Monterey Peninsula, all at Pt. Pinos. The prior birds were on 21 May 1966, 27 June 1975, and 1 May 1999 -- but this is the first to be documented with photos. As it turned out, the first-cycle Lesser Black-backed Gull at Marina (see details and photos from January, below) was an even rarer bird than initially thought. It was rediscovered in March by Brian Sullivan. In reviewing his photos, expert opinion from the Old World was that it is assignable to the taxa taimyrensis, breeding in northeast Asia and wintering in southeast Asia. This population is currently assigned to Larus fuscus [Lesser Black-backed] but some authorities split fuscus into several species. 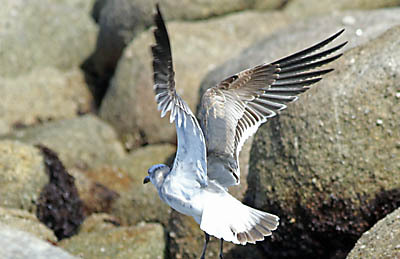 Under that approach, taimyrensis is a race of "Heuglin's Gull" Larus heuglini. The MTY bird, if accepted as taimyrensis, would represent a first for the New World under a new taxonomy. In Sullivan's photo below (17 Mar © B.L. Sullivan), the vagrant is on the left. It has new first-cycle back feathers but has retained juvenal lower scaps, upperwing coverts, and tertials. This state of plumage in late winter supports the i.d. as taimyrensis. Also in March, Blake Matheson found another Slaty-backed Gull, this one near Marina on 17 March (above left © B.T. Matheson). At the same location on 17 March was the same first-cycle Iceland Gull that Brian Sullivan had previously photographed at the Carmel River lagoon back on 22 January (see below; a March photo is above right, © B.L. Sullivan). 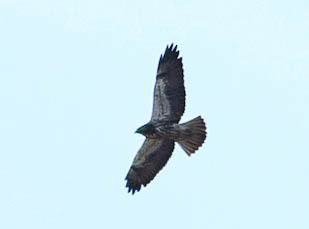 This individual had a unique smear of tar across two secondary feathers on its right wing, as shown in this shot. When one considers the amazing Black-tailed Gull, a taimyrensis Lesser Black-backed, two Slaty-backs, at least two Iceland Gulls, plus a vegae Herring Gull and an apparent kamtschatschensis Mew Gull, with a Laughing Gull as a late throw-in, well, never have so many high-quality vagrant gulls been seen within such a short span of time and place. And equally remarkable — every one was documented with photos. March was also the month in which our three amazing passerines at Laguna Grande finally departed, each having successfully wintered locally. The first to depart was the Lucy's Warbler, whose last known date was 4 March when it was photographed by Bill Hill (left, upper photo © Bill Hill). The Black-throated Green Warbler was last seen on 22 March, and also photographed that date (left, lower photo © D. Roberson). By then it was showing more black on the throat than had been there when it was discovered in December. 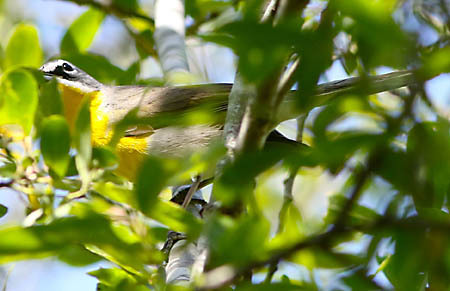 The lingering Yellow-breasted Chat — which you'll recall was an adult female that had lost its tail in late fall but grew in another over the winter — was last observed on 27 March (Virginia Chomat), still frequenting the same dense willow thicket at which it had spent most of the winter. Other passerines that completed a wintering stay included a male Orchard Oriole in Moss Landing, returning for a second winter (David & Jane Styer) and a male Summer Tanager in Pacific Grove that spent its 4th winter here (D. Roberson, R. Carratello, B.T. Matheson). Somewhat less rare, but always nice, were single Yellow, Palm, and Black-and-white Warblers at Laguna Grande, and another Black-and-white at San Carlos cemetery in Monterey. A scarcer bird — a male Williamson's Sapsucker found on private property in Corral de Tierra on 9 Feb (Patricia Farr) — did not survive the winter. It hit a window and is now a specimen at Calif. Academy of Sciences. 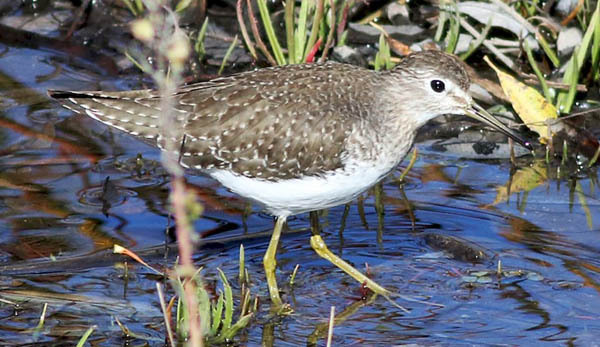 A Solitary Sandpiper found by Paul Fenwick on 15 January represented only the second winter record for MTY. This year's individual (photo right © P. Fenwick) was on a small rain-filled wetland near the west end of the now-closed Rancho Canada golf course, adjacent to the Carmel River in lower Carmel Valley. It is the first to be documented in a MTY winter by photos. The prior winter record was a long time ago: 27 Jan 1994 near the Pajaro River mouth (Michael Perrone). Gulls were the focus of most everyone's attention in January 2017. The story begins with "a man and his gull" (below © BL Sullivan). That's Blake Matheson pointing to the only gull on the beach at the very tip of Pt. Pinos. It is a Slaty-backed Gull. Blake discovered this mega-rarity — just the 3rd ever in MTY and super rare anywhere in California — on 9 January, and took photos, including this flight shot (below © B.T. Matheson). 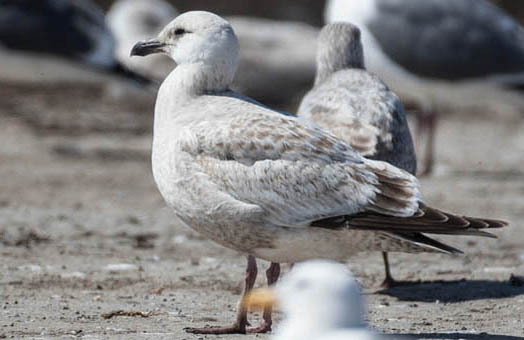 Notoriously difficult to identify, the fact that this second-cycle Slaty-backed Gull was molting in dark gray back feathers, and had a bright yellow eye, aided identification. Only Blake saw the Slaty-backed on 9 Jan, but it was on the beach at the tip of Pt. Pinos again the next morning; many locals got photos. 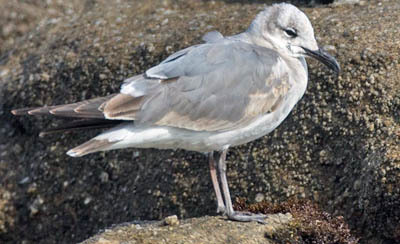 It was seen off-and-on through at least 12 Jan. On 12 January, the Ross's Gull in San Mateo County was the headline news (see Sidebar to right) but by mid-day on 13 January, word got out that a first-cycle Black-tailed Gull (below © D. Roberson) was at Pt. Pinos! While multitudes were still combing Pt. 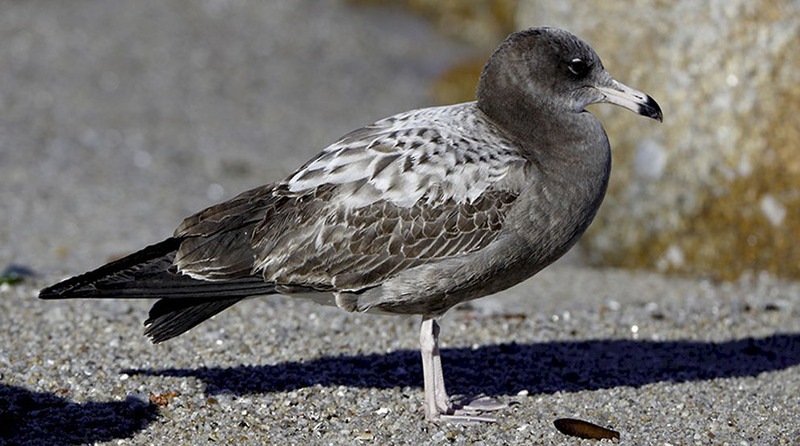 Pinos for the Slaty-backed Gull, word came at 2 p.m. on 12 January that an adult Ross's Gull was at Princeton harbor in San Mateo Co., two hours hard drive to the north. At least 4 MTY locals made it there before dark that day, and others reveled to the unworldly loveliness of this Siberian breeder the following two days. This was only the second California record. Given its preference for the edge of Arctic pack-ice, its presence in central California made it one the most spectacular rarities ever to reach this State [these photos, below, from 12 Jan © D. Roberson]. 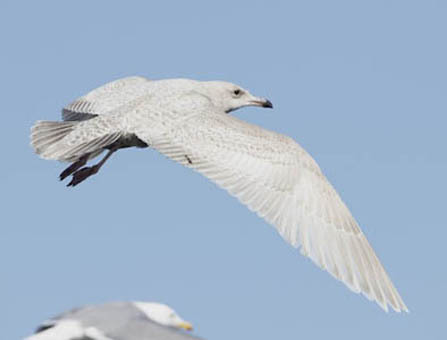 The odyssey of this Arctic gull had a poignant ending at 2 p.m. on 14 January. Tom Stienstra, wildlife writer for the San Francisco Chronicle, described it this way in the Sunday paper for 22 Jan: "After hundreds of people sighted and photographed the bird at the harbor, it flew north a mile to a field of Brussels sprouts opposite Half Moon Bay Airport . . . What followed shocked many who aren't always exposed to the full spectrum of nature: A pair of peregrine falcons, the fastest bird in the world and a fierce predator, teamed up and bushwhacked the rare gull. After a flight of 9,000 miles, one of the rarest wildlife sightings in California history ended up as lunch." 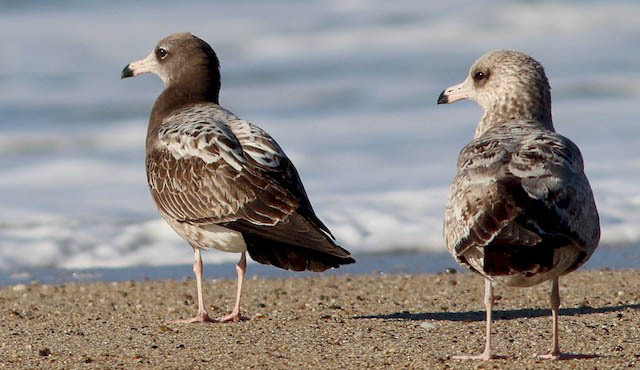 The combination of these three unexpected gulls from northeastern Asia within the span of just five days — and two of them in MTY — is unprecedented. The Ross's was a second State record. 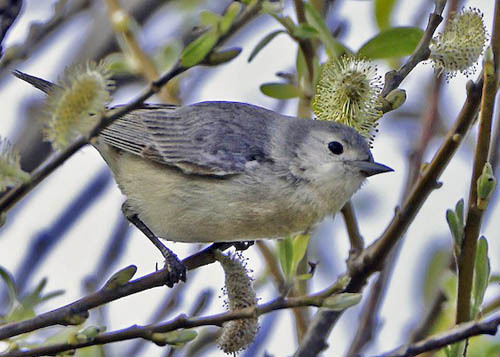 The Black-tailed was the first ever for MTY, and just the 4th for California. Slaty-backed averages less than 4/year in all of California, and almost none have been 'chaseable' for nearly a week. For those chasing and seeing all three of these gulls, the accomplishment became known as The Trifecta. A bit more about the two MTY gulls below. . . The Slaty-backed Gull (above and left, © D. Roberson) behaved quite differently that the other large gulls packed together at the tip of Pt. Pinos at high tide. It strode off alone, away from the other gulls. It hunkered down by itself just over the lip of the parking lot. On the day it was rediscovered — just after a rainy night — it walked into the middle of the parking lot and drank from rain puddles. It then strolled down Oceanview Drive until flushed by a jogger, flew a short distance to the next parking lot south, and went to sleep on a large comfortable rock. Like the Ross's at Half Moon Bay, it seemed oblivious to people and cars, sometimes walking right up to them. As to the Black-tailed Gull at Pt. Pinos, the initial question by many local observers was "Who found it?" 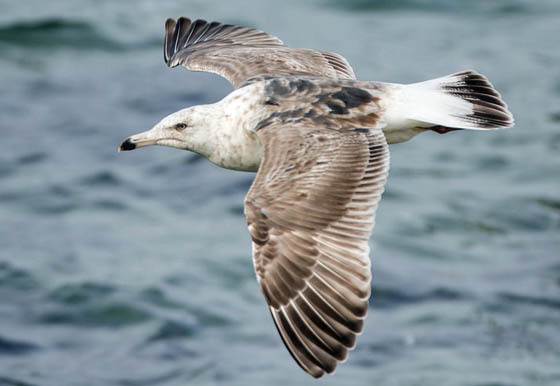 It was a first-cycle gull of a species not known to most American birders (its primary range is Japan and Korea). We got word by text from local birder Bill Hill at noon on Friday, 13 January. 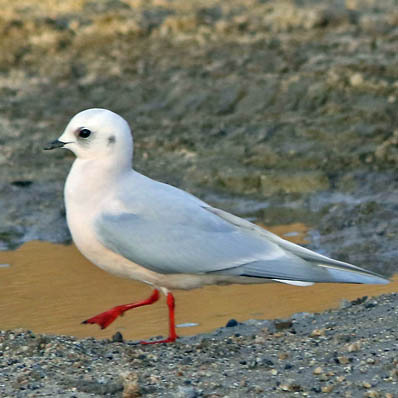 As it turned out, the Black-tailed Gull was discovered on the rocks across from Crespi Pond in late afternoon of Thursday, 12 Jan by Mark and Lucas Stephenson, father and son from Napa. They did not know what it was but took this photo (right © Mark Stephenson). The next morning an unfamiliar gull was spotted bathing in Crespi by Steve Turley, from Long Beach, birding with Becky Turley and Nancy Strang. The gull flew across the road to the beach, where Steve pointed it out to Tom Wurster, with Andrew and Vernon Howe, also from southern California. All of them were present in search of the Slaty-backed Gull (which was not found). Bill Hill arrived and together they came up with a probable Black-tailed Gull. Bill got the word out at noon— with a photo (one of Bill's photos is below, © Bill Hill) — and the stampede was on. Alas, at 2 p.m. the gull flew off northwest into Monterey Bay; many arrived too late. 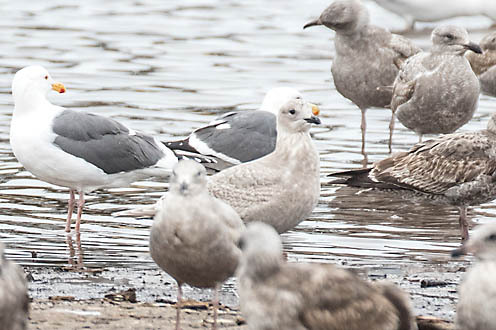 In the early afternoon of Sunday, 15 Jan, Breck Tyler rediscovered the first-cycle Black-tailed Gull at the Carmel River mouth lagoon (photo left, with a California Gull, © W.B. Tyler). Two days later, near dusk on 17 Jan, a number of local birders watched it fly in from the sea to check out the Carmel lagoon, and fly out to sea again. It was then seen at Crespi and nearby on 18 Jan, but it has not been convincingly reported since then, despite the efforts of many to relocate it. 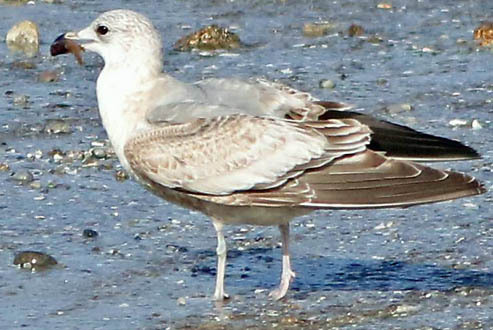 A gull showing characters "Kamchatka" Common Gull, a NE Asian population currently lumped by AOU with Mew Gull [L. canus kamtschatschensis] but split by other authorities, at Pt. Pinos on 21 Jan (below right, photo © D. Roberson). 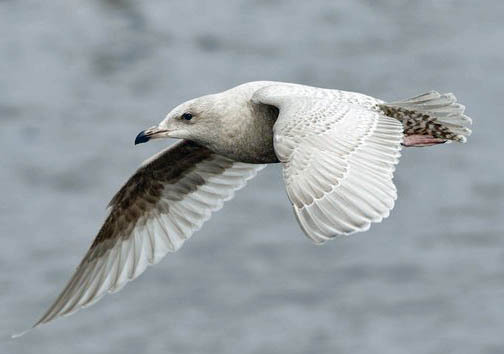 As to the latter, the "Kamchatka" Gull looked structurally like a Ring-billed Gull, being larger, longer-legged, and longer-and-thicker billed than Mew Gulls nearby. Tail pattern (mostly dark) was a concern but this pattern was similar to 40% of the Kamchatka tails studied by Adriaens & Gibbons (2016). In the photo here, it had just caught a small fish in the high surf. And then — just when we thought no more rare gulls could possibly be found — Brian Sullivan struck again with a first-cycle Lesser Black-backed Gull at the Marina landfill on 25 Jan (photos right and below © B.L. Sullivan). The white rump and tail, with its broad blackish subterminal band, is distinctive. Note also the many crisply-edged juvenal feathers on the lower back, scaps, and coverts, producing an appearance in first-winter gulls unlike anything shown among other usual assortment of Larus gulls and their hybrids. This is the 3d MTY record and a rarity anywhere in the State. The first two record for MTY were adults, and both were a long time ago: 14 Jan 1978 Roberts Lake (L.C. Binford, B.D. Parmeter, Ron Branson) and 11 Jan 2003 on a sandbar in Elkhorn Slough (Todd Easterla, Steve Rovell). Word of these birds did not get out quickly, so neither proved chaseable. 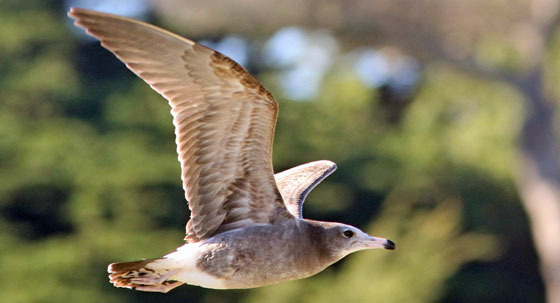 The 1978 gull was the first record for California, and Laurie Binford published a classic paper on its occurrence and identification (Binford 1978). In decades past, all claims of Swainson's Hawk in winter were considered bogus the moment they were mentioned. Many birders have problems identifying raptors. But in recent years a few absolutely legitimate Swainson's Hawks have been found in winter here in MTY. 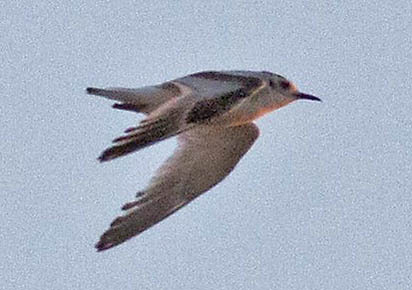 This year it was this light-morph bird (photo right © Paul Fenwick) seen over Laguna Grande Park on 6 Jan by Fenwick, Jim Mitchell, Steve Rovell, and Rick Fournier. Later in the day it was seen again over Hwy 68, heading towards Salinas, and then either this bird, or another like it was north of Salinas over Hwy 101 on 14 Jan (Karen Vandergrift). 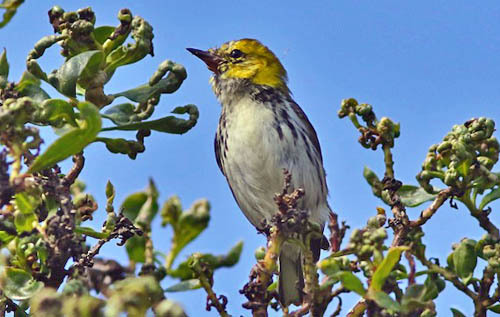 The birding year begins on 1 January, as always, with the Moss Landing CBC. This year's count was very good, with 199 species (pending review of rarities). 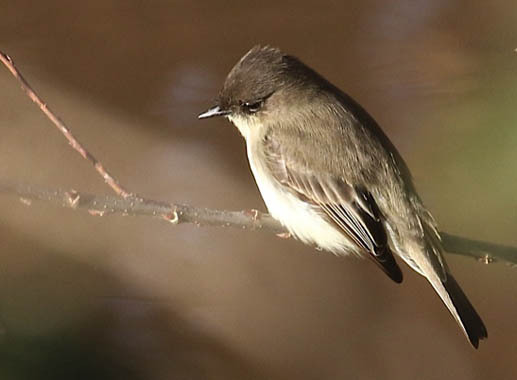 Among the best from the MTY part of the count circle was a Bank Swallow on the private-owned Packard Ranch, north side of Elkhorn Slough, found by Peter Metropolus and well-described by Mark Kudrav in eBird. This is now the 3rd MTY record in winter (all in early to mid January) but the best documented one yet (none of them was photographed). Last year's male Orchard Oriole also returned to Moss Landing town over the New Year (David Styer). 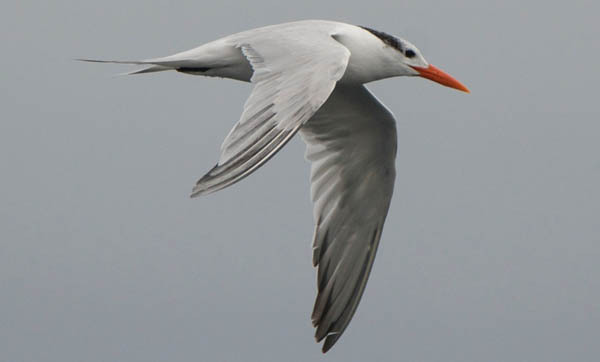 What was nicely photographed was this vagrant Royal Tern, foraging inshore from Otter Pt. to Pt. Pinos on 4 Jan, found by Brian Sullivan (photo left © Cooper Scollan from Otter Pt.). Perhaps even more amazing was that the rare landbirds at Laguna Grande Park, all photographed on the Mty Pen CBC (see last update), that were still present into January: Yellow-breasted Chat, Lucy's Warbler, Black-and-white Warbler, and Black-throated Green Warbler. All were seen into late January when this report was updated. Adriaens, P., and C. Gibbons. 2016. Identification of the Larus canus complex. Dutch Birding 38: 1-64. Binford, L.C. 1978. 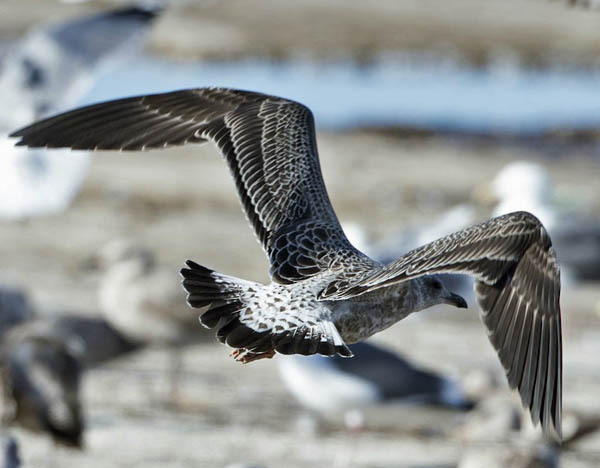 Lesser Black-backed Gull in California, with notes on field identification. West. Birds 9: 141-150. More highlights will be posted as they arise and are documented with photos.